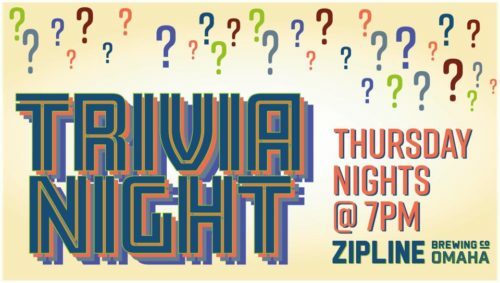 Trivia - Omaha Taproom - Zipline Brewing Co. The time has come for the first Session of Zipline Trivia in the new year! Gather up to three friends (or compete by yourself and prove you truly have the biggest brains) and get here Thursday nights at 7pm to test your knowledge on everything from beer to pop culture and everything in between! Members of the winning team every week will receive a card for a free pint, and returning teams will have their weekly points totaled at the end of the six-week series to take home the series grand prize! You won’t want to miss a single week!